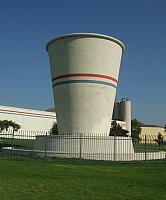 In Riverside, there is a giant 68.1 foot tall "paper" cup. Branded as the World's Largest Paper Cup, it is painted concrete, and is currently painted all white. 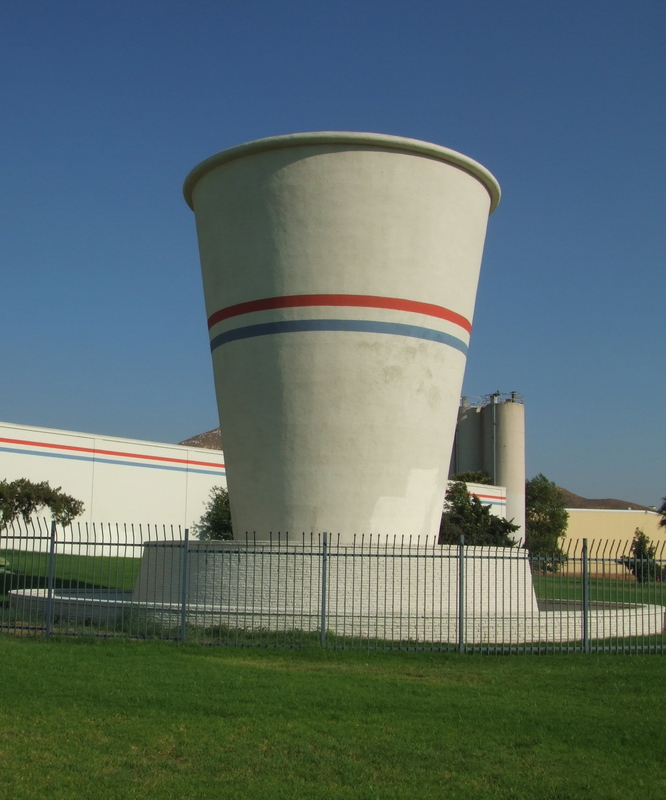 Originally and from 1958 to 1997, the building which the giant cup stands outside of was a factory manufacturing, not surprisingly, paper cups. Currently I believe it is a furniture liquidation outlet of some sort. The building was part of the Lily Tulip Cup company until Lily Tulip was acquired by Sweetheart Cup Company. At that point the giant cup acquired the Sweetheart logo on itself. Post Sweetheart, the cup at first had two horizontal stripes, a red one over a blue one, but now is simply plain white. A few years after the building no longer manufactured paper cups, Sweetheart Cup Company was acquired, in 2004, by Solo Cup Company. So if you need a big cup of coffee, here's the cup for you!